Take on your most important tasks with the power of a Lenovo IdeaPad 510s laptop with a 14" screen. This laptop features 8GB of memory, a 256GB SSD and Windows 10. 14" display for viewing movies, social media and photos. 1920 x 1080 resolution produces crystal-clear images. Powered by 6th Gen Intel Core i7 for the speed you need. Multitask with ease – play, work and surf the Web. Features 2 USB 3.0 ports for ultrafast data transfers, as well as 1 USB 2.0 port. USB 3.0 is up to 10 times faster than USB 2.0, yet fully compatible with USB 2.0. Built-in webcam and microphone, so you can keep in touch with others via video and voice messaging. Supports video resolutions up to 720p. Sound by Harman® helps create immersive audio from your favorite games and movies. Stays powered for up to 6 hours before recharging is needed. Battery life will vary depending on the product configuration, product model, applications loaded on the product, power management setting of the product, and the product features used by the customer. As with all batteries, the maximum capacity of this battery will decrease with time and usage. Thin and light, the 14" Lenovo Ideapad 510S enables you to be productive and entertained wherever life takes you. Choose from a variety of configurations, including discrete graphics and hi-res display, to match your budget. And then get blown away by the powerful processing, lightning-fast Wi-Fi, and premium audio that come standard. Ultraportable yet very powerful, the Lenovo Ideapad 510S is perfect for those who like to work, game, or be entertained on the go. 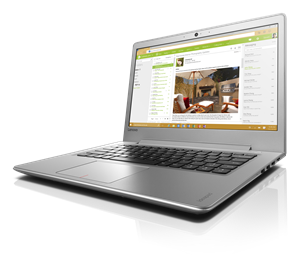 In fact, the Ideapad 510S weighs only 3.74 lbs (1.7 kg) and is only 76" (19.3 mm) thin. The Ideapad 510S has a look that shows off an impeccable attention to detail. The aluminum cover with nickel plated logo, aluminum palm rest, and diamond-cut touchpad lend an air of class you won't find in just any laptop. A blazing fast, feature-packed processor family with built-in security is ready to take your productivity, creativity, and entertainment to the next level. Strike your own balance between cost and graphics power. For everyday PC use and rich, stunning visuals wherever you go, stick with the integrated Intel® HD graphics. For truly vivid colors and nearly 180° of viewing angles, configure your Ideapad 510S with a 14" Full HD display with In-Plane Switching technology. The Ideapad 510S's 802.11 a/c Wi-Fi lets you browse the web, stream music/movies, and share things faster than ever.